Venus is the Goddess of Love. In Astrology, Venus has dual rulership over Libra and Taurus. As a result, Venus represents two main areas of our life: love and money. "Love and money" is actually a simplistic interpretation of Venus. Venus rules our sentiments, what we value, and the pleasure we take in life. Grace, charm, and beauty are all ruled by Venus. Through Venus, we learn about our tastes, pleasures, artistic inclinations, and what makes us happy. Traditionally, astrologers have interpreted the position and condition of Venus in the natal chart differently depending on the gender of the native. 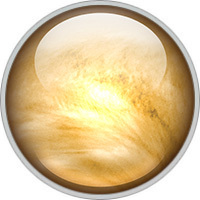 The reason for treating Venus in men’s and women’s chart differently is based on the idea that men may tend to "disown" the qualities of Venus in his own chart. Venus is all about pleasure, especially pleasure shared with someone else. This planet concerns itself with love, romance and harmony in our emotional attachments, marriages, friendships and other unions (like business partnerships). Venus is content to spread happiness and tenderness, all the while teaching us how to love and appreciate others and the things that we possess. We appear attractive - and we attract others - thanks to Venus’s energy. Socializing with and relating to others are important to this planet. Beauty is also strongly associated with Venus. The arts (music, dance, drama and literature, to name a few) and a sense of the aesthetic fall within the realm of Venus. Venus beseeches us to indulge our senses and revel in the beauty of our world. This planet is inextricably linked to refinement, culture, charm and grace. Venus also deals with the pleasure we derive from our possessions. Luxuries (jewelry, paintings, expensive cars), good food and drink, a beautiful home and a sense of refinement all please Venus’s interests. This planet asks us to appreciate the exquisite nature of things. It’s a sensual - though not necessarily sexual - world as far as Venus is concerned. Venus takes 225 days to complete its orbit of the zodiac; it is never more than 47 degrees from the Sun. It is a feminine energy and rules both Taurus and Libra, and the Second and Seventh Houses.